Pace Gallery devoted two of its venues to house the art of teamLab, a collaborative of Japanese digital artists, for a month-long exhibition that ended on August 15. 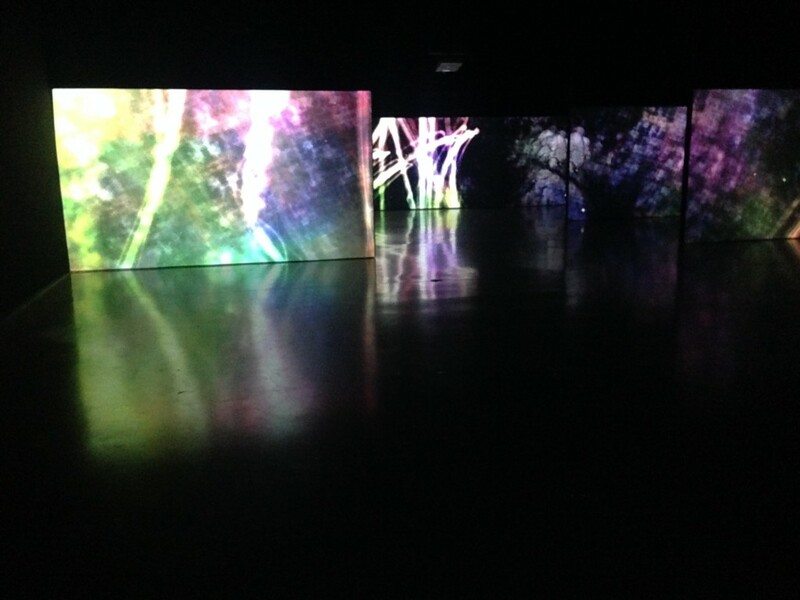 The first public display of works in the US for teamLab, Ultra Subjective Space consisted of five large pieces on digital monitors, including the mesmerizing installation Crows are chased and the chasing crows are destined to be chased as well, Division in Perspective – Light in Dark. In the darkened room, seven giant monitors flickered with electricity moving through space. An animated version of Yatagarasu, the mythological three-legged crow that symbolizes guidance, flies through the air. 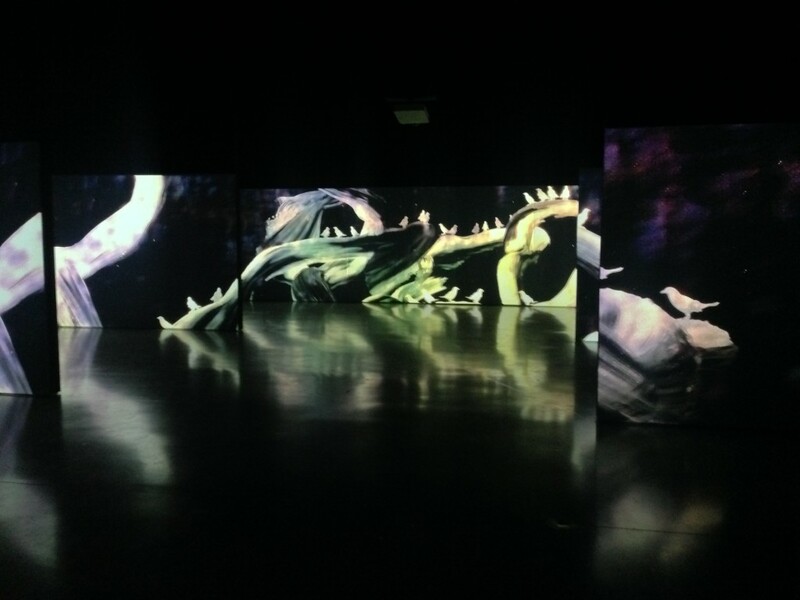 The animations in this installation distort the viewer’s relationship with space, leaving one wondering where one monitor ends and the other begins. The other room had a more traditional Japanese look and feel. 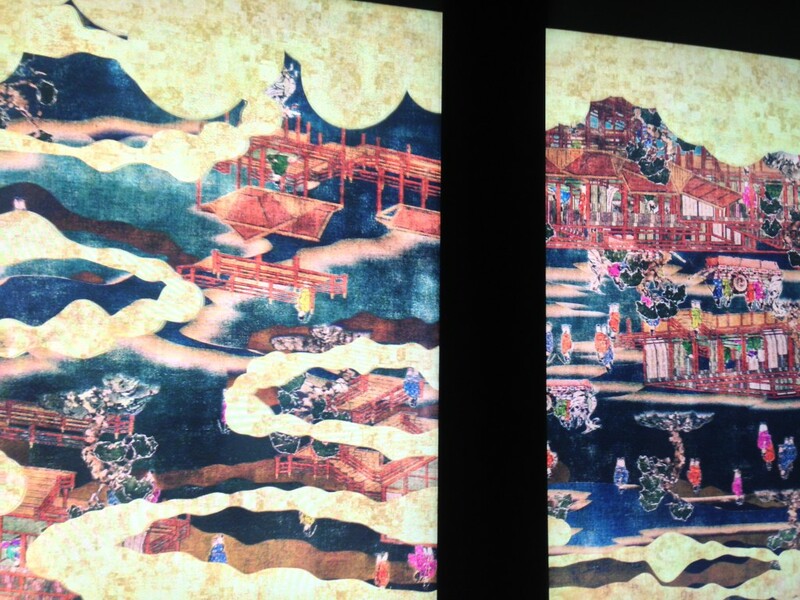 Gold leaf found on traditional screens that fall away to reveal detailed paintings bring to mind scenes from The Tale of Genji in the piece Flower and Corpse Glitch Set of 12. Old estates and people float throughout the twelve screens. 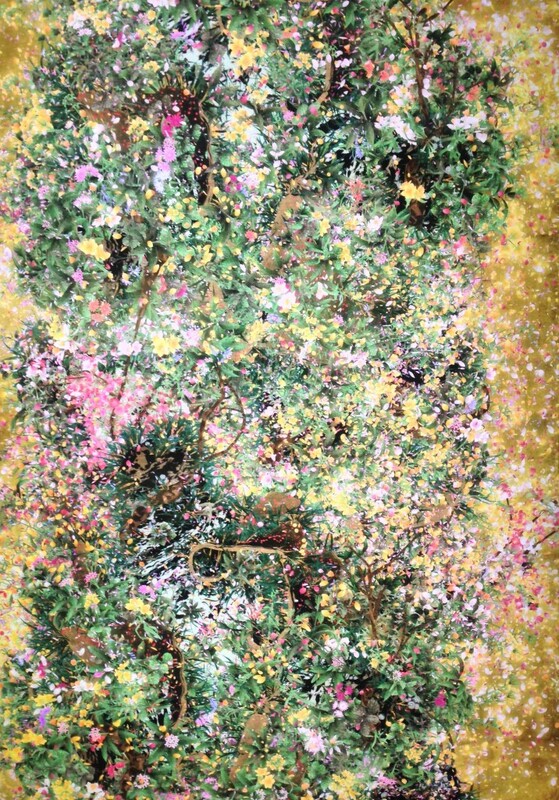 After a few seconds the paintings shatter, with shards falling away to reveal the 3D models that rendered the figures, reminding the viewer that the art is computer generated. Flower and Corpse Glitch Set of 12 and the other pieces in this venue – Universe of Water Particles, Cold Life, and the two versions of Ever Blossoming Life, Gold and Dark – have the theme of regeneration or rebirth. Flowers bloom then die, their petals scattering. Water falls, their particles evaporating and floating up in the air. As the Chinese character for “life” is rendered in an electronic version of calligraphy, branches of a tree grow and living creatures appear. Looking into the monitors is watching art take shape, like watching a live-art performance without the artist. 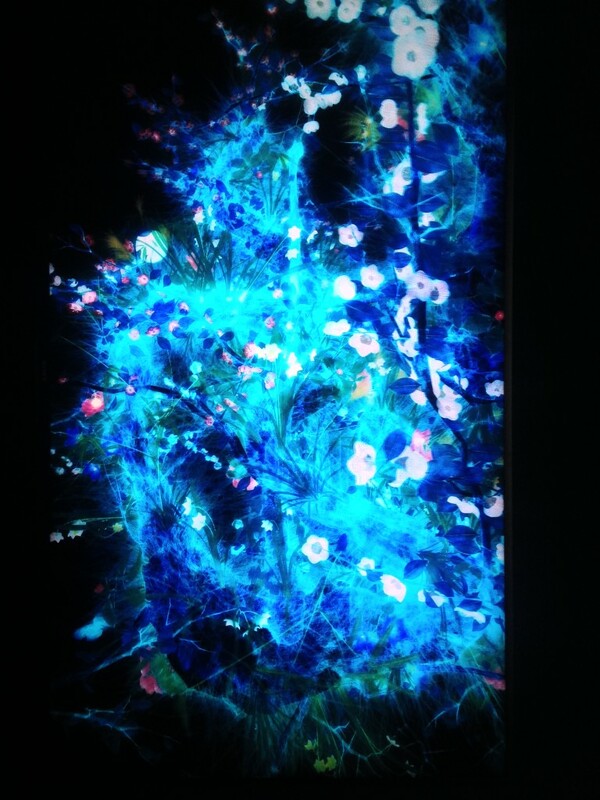 To see teamLab’s computer-generated art is seeing the evolution of painting before your eyes. 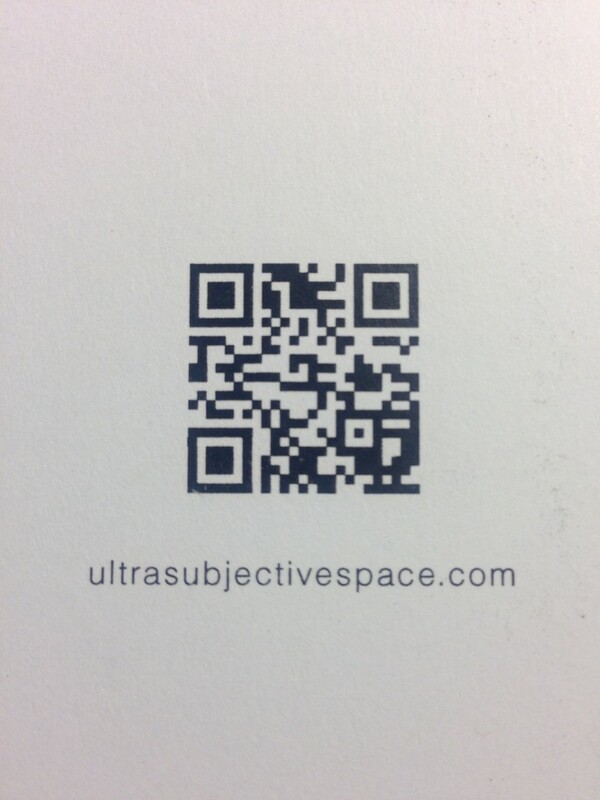 If you missed this exhibition at Pace Gallery, an e-catalogue is available online or by scanning the QR code below. The e-catalogue includes videos and descriptions of each work, as well as an interview with teamLab founder Toshiyuki Inoko and Yuji Yamashita, art historian and professor at Meiji Gakuin University. Still photography does not do the works justice. The art of teamLab must be experienced in person, far enough away to be encompassed by the scale of the installations and close enough to admire the detail. 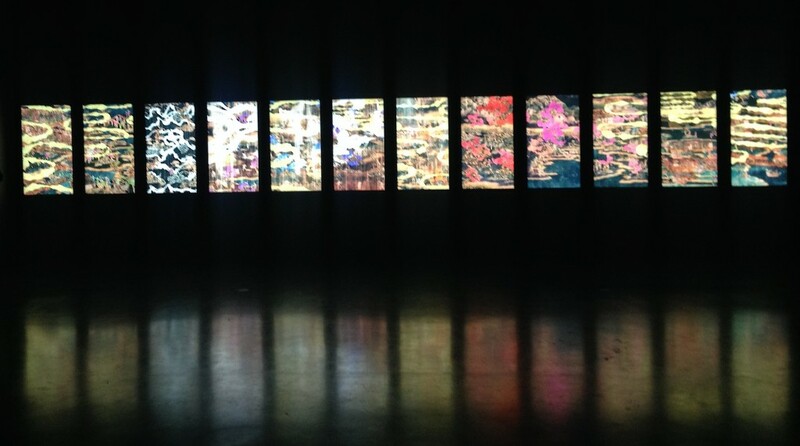 Be sure to see teamLab at Japan Society Gallery in the upcoming group exhibition Garden of Unearthly Delights: Works by Ikeda, Tenmyouya and teamLab running from October 10 through January 11, 2015.